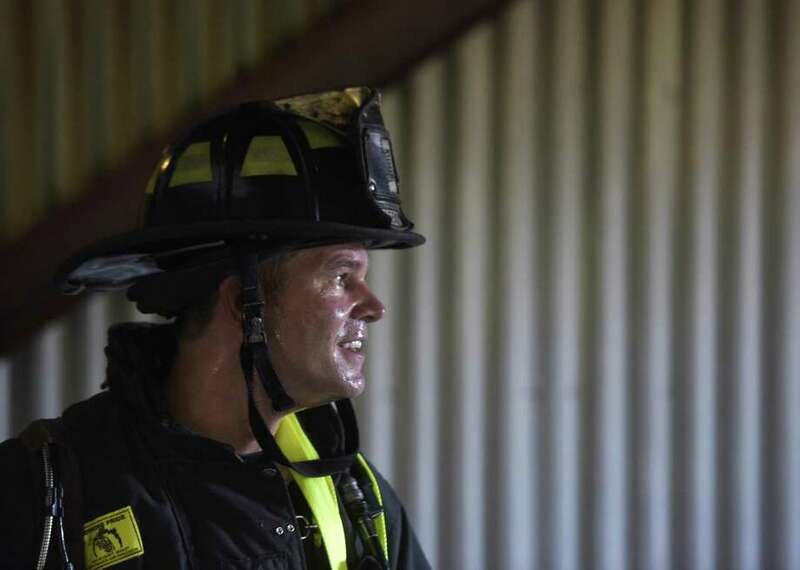 Firefighter Mike Wilson sweats after descending from a window using the new bail-out kit at the Greenwich Fire Department training center in Greenwich, Conn.
GREENWICH — Data compiled by the Greenwich Fire Department shows a stark contrast in call response times between the north side of the community and the southern end of town. Response-time data from 2017 and 2018, obtained through a Freedom of Information request, shows that residents and business owners in Cos Cob and Riverside can expect to see a fire truck rolling up to the scene of a call or alarm in two to three minutes. In the north end of town, however, particularly the northwest corner along the King Street corridor, it can take 10 minutes or more for a fire truck to arrive. Firefighters “absolutely” make a maximum effort to get to the scene of a fire as quickly as possible, Assistant Fire Chief Robert Kick said. But due to the lack of a fire station in the northwestern, now the subject of renewed discussions among town leaders, response times lag substantially. At a house fire on Meadow Road in Riverside in May, for instance, a fire unit arrived on scene in one minute and 30 seconds. By contrast, at a fire on Locust Road off King Street in August, it took nine minutes and 56 seconds, according to the fire department. When looking at the response times for car fires, another wide gap is apparent. A car fire on I-95 in January 2017 triggered a fire vehicle’s arrival in three minutes and five seconds. For a car fire on the Merritt Parkway in June of last year, it took 10 minutes and 41 seconds for a unit to arrive on-scene. Response time is measured by mobile digital devices inside the trucks. Some vehicles in the fleet don’t have the digital devices installed, and in those cases, the dispatcher will mark the time using radio transmissions, Kick said. Members of the Representative Town Meeting and other town leaders have been studying the problem this summer and fall. But the issue isn’t new. Previous efforts to fund a new fire facility in the northwest corner, or even study the need for one, have failed to advance. “In the fire department administration, we’ve identified the northwest quadrant, where we’re not meeting the minimum standards, ever. We want to correct that problem, and our suggestion is to build a station there, so we can better protect the citizens of the area,” said Kick. First Selectman Peter Tesei put money for a study of town fire services, to determine whether the station was needed, in his budget in 2017, but the RTM voted to cut the funding. It was the latest setback in a long-fought effort to get fire coverage in the northwest. The issue of response times is one of deep concern to many residents of the area. The fire on upper King Street this past summer gave renewed attention to the issue of fire safety. It was deeply unsettling to Ilana Grady and her children. The RTM appears to be softening its resistance to a new station. Last month, its members approved a nonbinding, sense of the meeting resolution calling for Tesei to put funding for a new station in the 2019-20 municipal budget. The resolution does not obligate the RTM to pass the actual funding, however. Allen Williams, president of the Northwest Greenwich Association, has been lobbying for years for a new fire station in the neighborhood. Maps and data released by the fire department put the issue into clear, concise terms, he said. A map depicting response times was part of a recent presentation to the RTM. The first step will be getting a concept for a new station approved, he said. Then town and fire officials will have to find a suitable piece of land. Several possible sites have been pegged and rejected in past years. Most recently, Tesei in 2016 proposed buying 4.76 acres on King Street from the Fairview Country Club, an idea that won approvals from the Fire Department, finance board and Planning and Zoning Commission, only to be shot down by the RTM. “The siting decision will likely be a hotly contested hurdle,” Williams said. The country club property is still available, but Tesei has said he is going into the new process with an open mind toward potential options as some in town have questioned whether the site is the best location for a new station. Tesei said he would continue to work to find a solution.